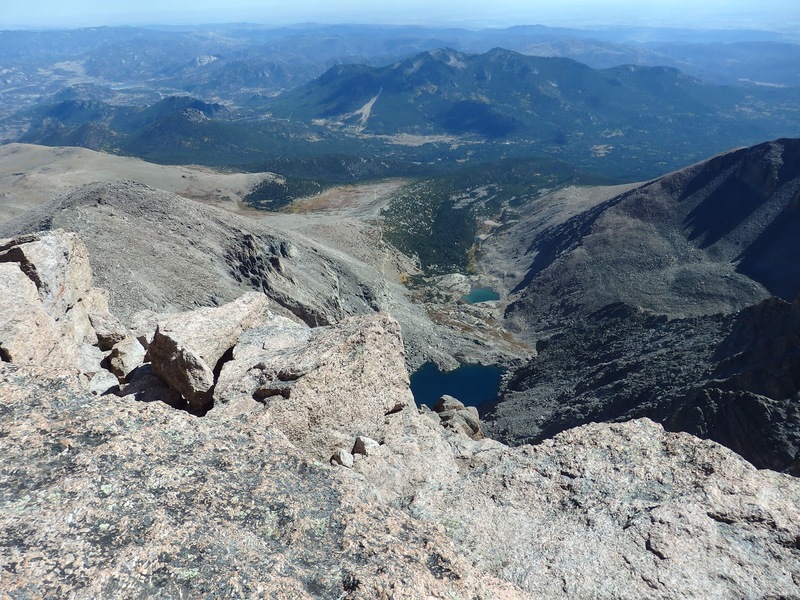 This spring the ball was set in motion for an opportunity to climb Longs Peak (14,289). I’ve had this mountain on my sites for a long time. 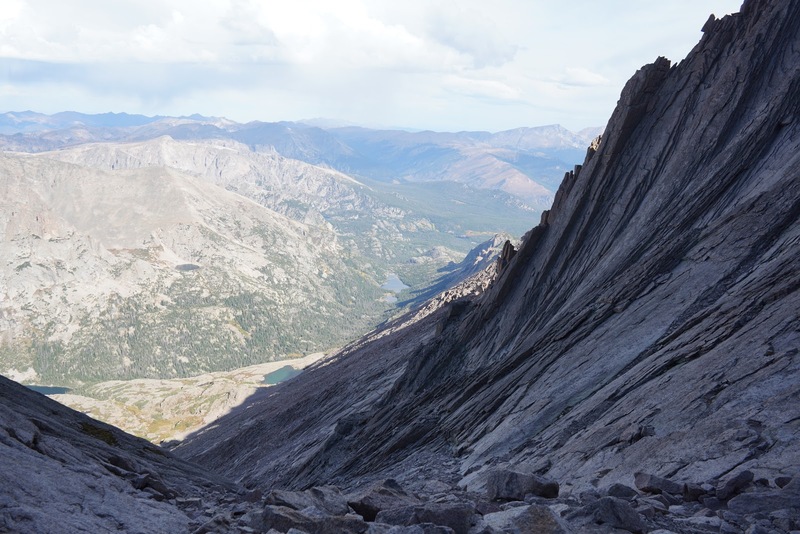 I had a taste of Longs Peak all the way back to 2004 when I was in Colorado for a wedding. Back then I had the opportunity to hike the first mile from the trailhead and set up camp at Goblin’s Forest (10,120), the date was June 21st, with the hope of seeing the Keyhole but was turned back by a snow storm and therefore only wet my appetite for another day to give it a shot. 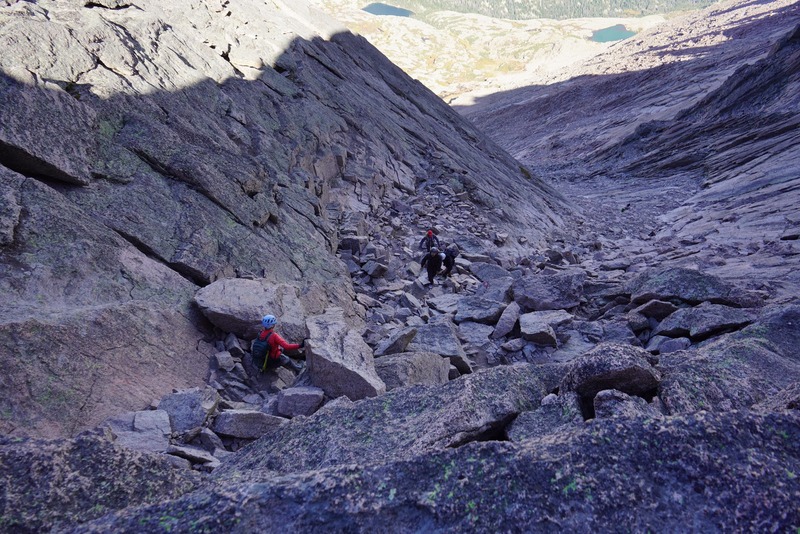 Back in 2004 when I checked out Long’s Peak I had already climbed Colorado’s high point Mt. Elbert (14,433) which was my first 14er & was basically just a long hike with a little bit of a scramble just below the summit. A few days later I ran a marathon up Pikes Peak (14,114) which to this date was my hardest marathon, but again I just slogged up a trail to the summit. My only other 14’er in Colorado was in 2009 when I cycled to the top of Mt. Evans (14,265). 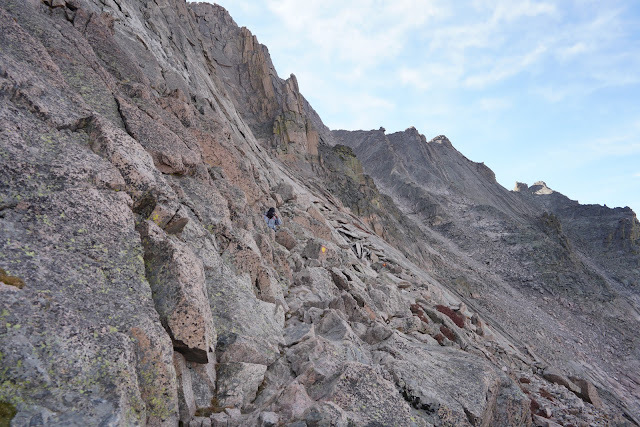 None of those three peaks compares to Longs Peak since 1.3 miles from the summit you enter thru the “Keyhole” at 13,200ft and begin a Class 3 scramble the final 1,000ft, a technical route that would take me 3 hours from camp at a “the Boulder Field” (just below the Keyhole) and another 3 hours down from the summit back to the Boulder Field. When you read about climbing the Longs Peak 7.5 mile route to the summit it can be broken down into two sections. 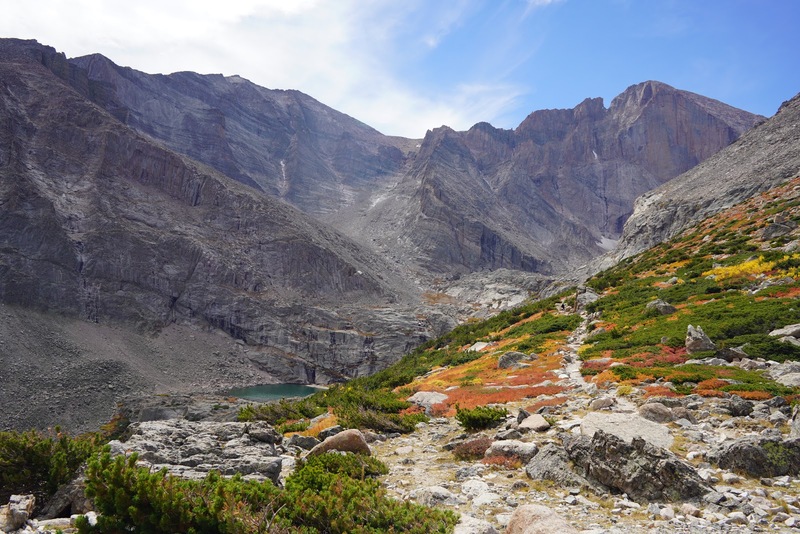 Attempting the route is 10-15 hours so can be done either as a long day hike beginning at 2a.m the day before so you reach the Keyhole at sunrise or climbing to the Boulder Field below the Keyhole with a backpack, camping at 12,760ft, and getting up at sunrise to tackle the upper section of the mountain. I debated on which choice and for me a fresh start to the technical section of the upper route meant I would have to carry all my camping gear the day before and spend the night on the mountain. 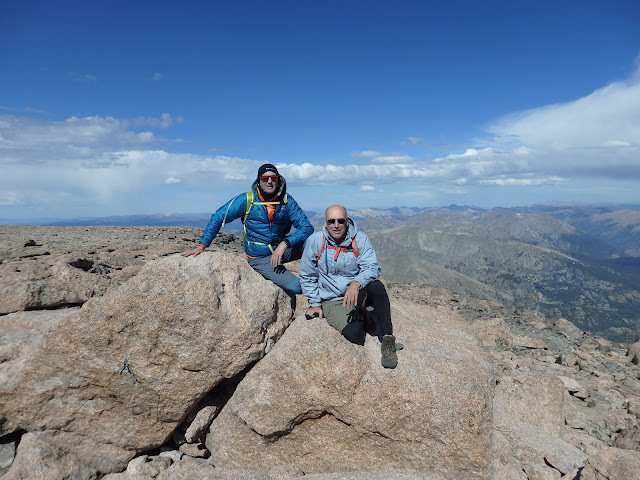 I didn’t want to tackle this summit alone so when my good travel buddy George announced his retirement and that he was going to take a two month vacation across the west first heading to Rocky Mountain National Park it was all it took to begin planning the summit. The trip was planned for mid-September which was at the very end of climbing season. The number one rule for Longs Peak is “weather” so there was only a 50/50 chance the conditions would be favorable to make a summit bid. 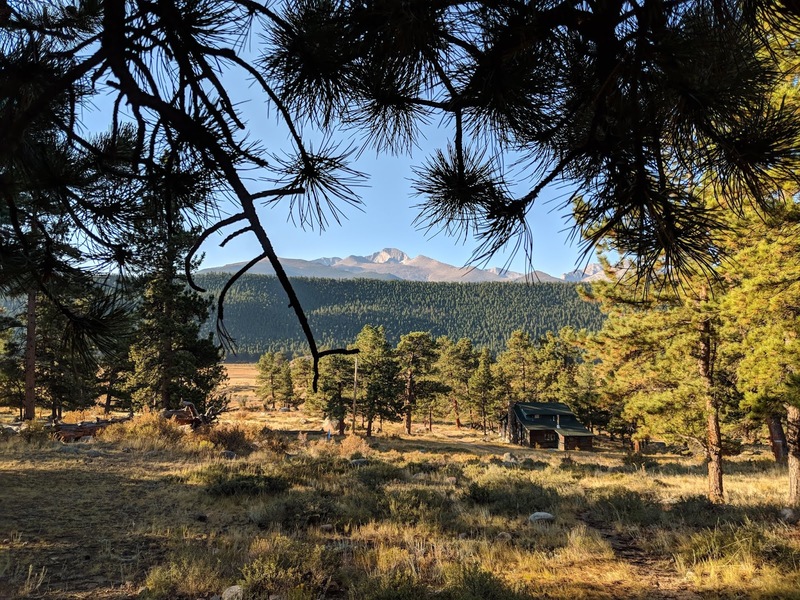 We were to arrive in RMNP three days earlier and on our fourth night we were able to reserve one of the 6 camp sites in the Boulder Field (successfully requesting our date 5 months earlier). The two days prior to beginning Longs Peak trail I was lucky to have a high school friend who had already reserved 2 sites for 2 nights in Moraine Park and we lucked out as his friend couldn’t make it and we could stay share his site. One obstacle coming from sea level is the unpredictable way your body will adjust/react to the elevation change. I’ve found that Diamox a couple days before travels does wonders for me so arriving in the mountains while sometimes a simple flight of stairs can leave you breathless I was adapting well. We had two days to acclimate and the first day was our first test. 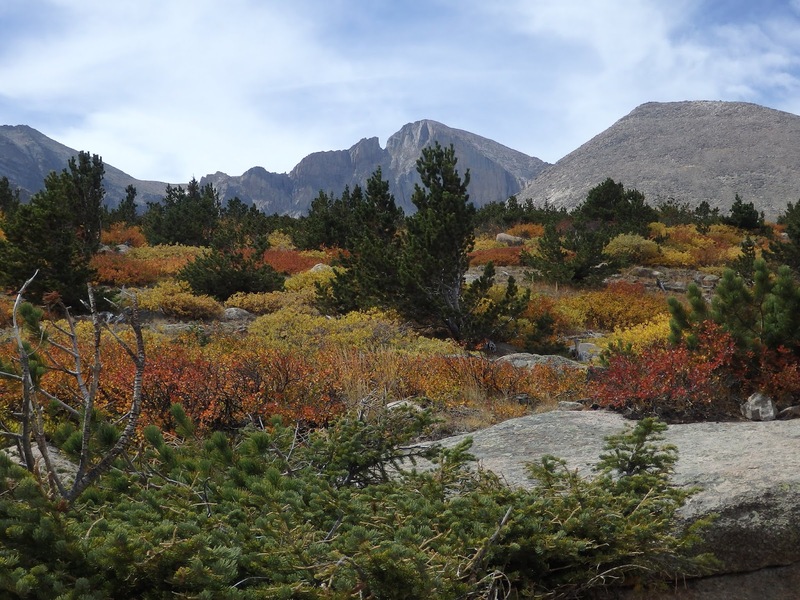 We decided to hike from Bear Lake to Flattop Mountain summit, about 9 miles round trip ascending to 12,000ft. This was a tough hike so we decided to take it a little easier the following day (and only 1 day before our big climb) Another friend of mine who lives in Fort Collins joined us for the day and drove us up to the visitor center atop of Trail Ridge road. We stopped several spots including 12,000 feet again and hiked up the ½ mile Alpine trail followed by a 4.4 mile hike to Milner Pass from the visitor center. 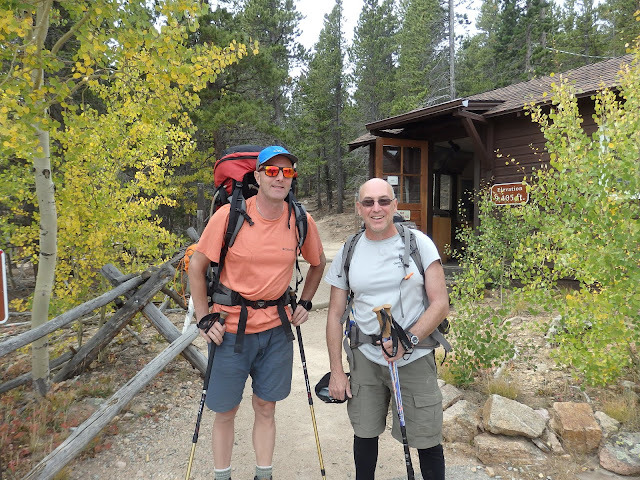 Two days at this elevation and thus far we were both feeling great, not to mention we got a taste for the wind and temperature we could expect at base camp below the summit which should be similar and as a bonus was unseasonable warm for mid September. Sunday before the Ranger’s office closed, we picked up our back country permit to camp. The ranger confirmed we should have a good window to climb and we learned we needed to have a hard plastic bear container. Bummer because I just bought a Kevlar bear sack before flying to Colorado and left my plastic container at home so we would have to rent one. With a little nervous energy, Monday morning we packed up camp and packed out backpacks for our big day. The temperatures shouldn’t dip lower than 30 degrees where we were climbing to even at night which was really good for mid September. We divided up weight and headed to the trailhead. For a Monday the lot was completely full but we found a makeready spot that would do nearly right in front of the ranger’s office at the trailhead. A ranger greeted us and confirmed we had a parking pass, backcountry permit, and our bear container. No food could be left in the car so we also unloaded all of our food and put in large bear containers next to the parking lot. We actually were right on time, but seemed like a late noonish start up the mountain. George had once hiked to the Keyhole and turned around so between the two of us we had a little familiarity with the trail but the one thing we both knew it was a long way to the top. 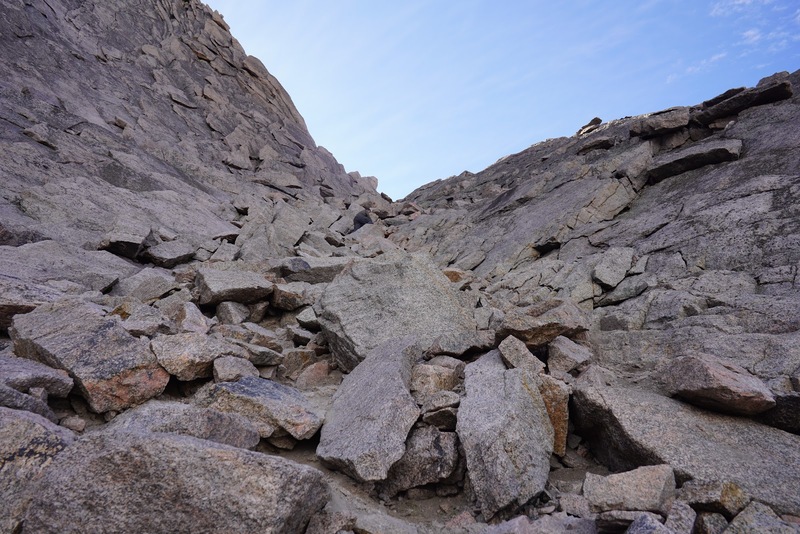 It took 5.5 hours for us to make it to the Boulder Field, trying to break the hike into smaller segments and many rests. 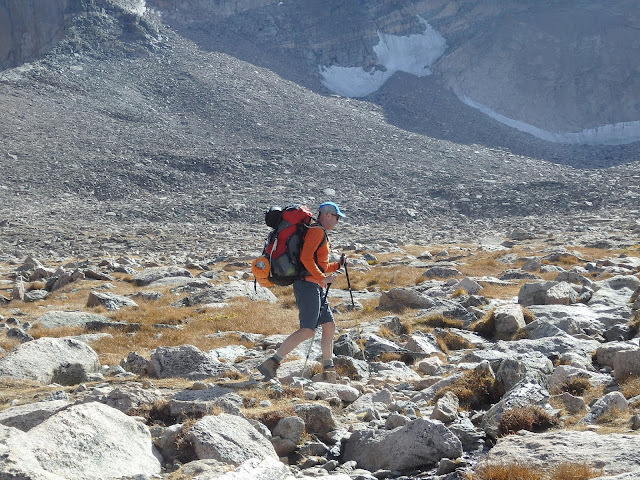 Once we passed the turn off to Chasm Lake we started passing hikers coming down from the summit. Everyone we passed had made it to the summit earlier in the day which was very encouraging. (if they could do it I could too I thought!) One lady said, “that’s a one and done thing for me” but I’m pretty sure she enjoyed herself. 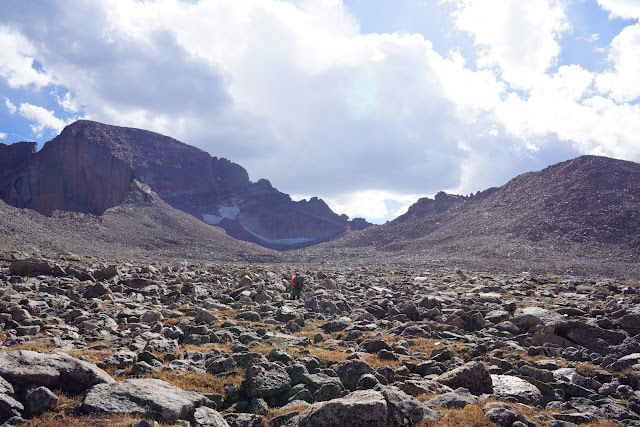 We learned there is water in the Boulder Field we could filter so we only carried enough to get us to base camp. We were exhausted but wasted no time filling water bottles, setting up tents and cooking dinner. 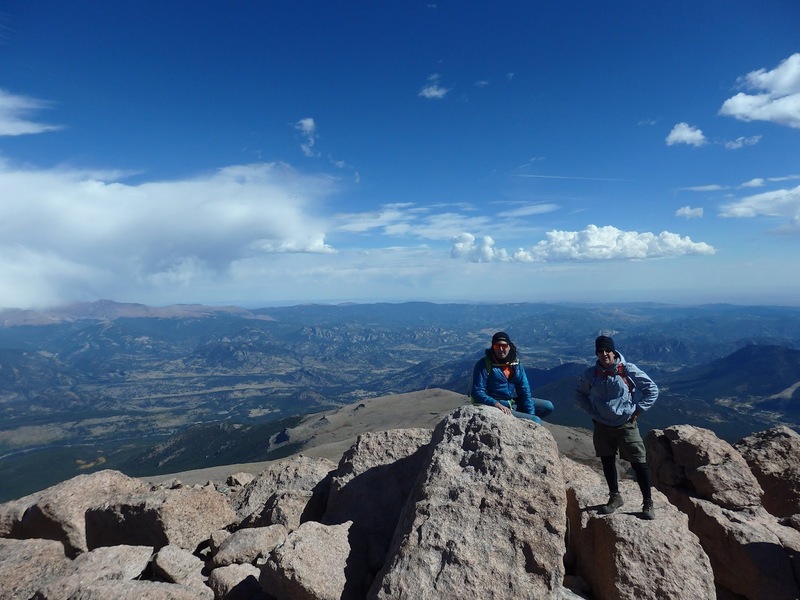 At over 12,000 ft you lose your appetite and have to force yourself to keep drinking to stay hydrated. 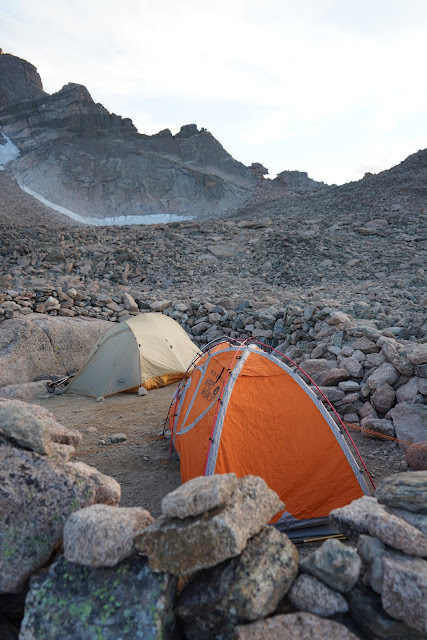 After dinner and even before sunset we both climbed into our tents and called it a night. There were still hikers coming off the summit after we made camp from the morning before and one guy was severely dehydrated. A couple other’s gave him water and encouraged him to spend the night, but the guy decided to climb down. It was already almost dark so best case scenario he would make it back to the trailhead by midnight. Another hiker had a satellite phone and radioed to the ranger station to let them know we were worried about this guy on his own. This was a good reminder that we had to constantly drink all night to rehydrate for our summit climb in the morning. We would get nearly 12 hours of rest, if you call it that. There were bathrooms about a 5 minute walk and I think I got up 3 times in the night and put on warmer clothes and made the trek, of course each time enjoying the splendor of the stars and Milkyway but I didn’t have the energy to try to take any night shots nor get into the bear container to take one of my last Diamox tablets, so laid awake on and off with a bit of an altitude headache. 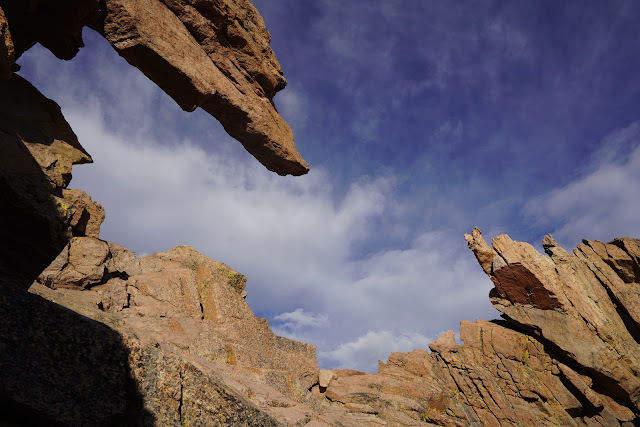 The wind picked up several times throughout the night and shook the hell out of our tents, but we had them securely fastened to a bunch of rocks. I think I sort of talked George into climbing Longs Peak and either he was serious or joked again and again about letting me climb to the summit myself. Honestly, when I woke if he would have said you are on your own I would have turned around without any questions asked. Morning came and we both nearly finished a liter of water. We packed peanut butter and jelly on English muffins for breakfast and lunch and it was so hard to swallow so I had to eat in small bites over several hours as I made my way up the mountain. 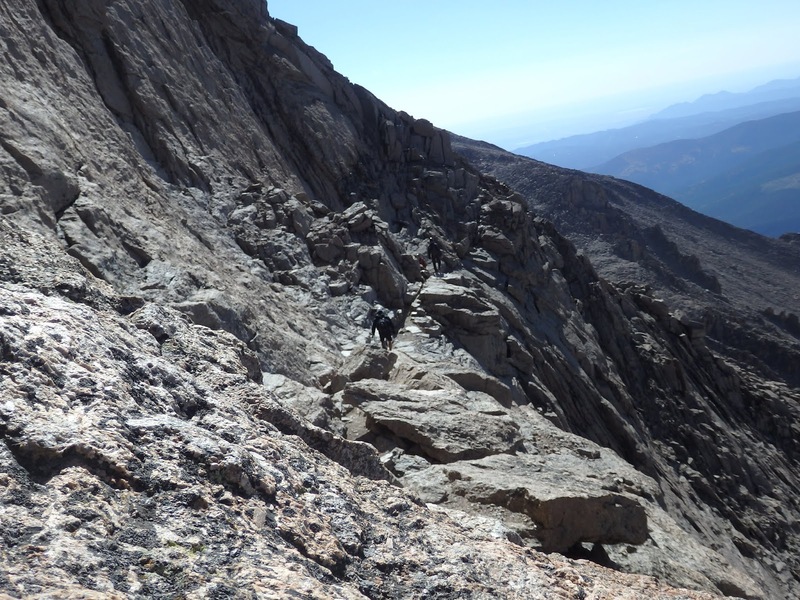 There are basically two parts reaching the summit of Longs Peak, first getting to the Keyhole, mostly a long steep 6 mile hike. The last 1.3 miles is where the climb starts to get real interesting! Leaving base camp just getting to the Keyhole was a slog, one step at a time. On the way to the Keyhole was a combination of overnight hikers as well as those that had started from the trailhead really early in the morning. There is a hut at the Keyhole for protection from storms we made it to in less than an hour and we found a half dozen hikers stopped. A couple went thru the Keyhole and disappeared while the rest of the hikers their goal was to turn around at the Keyhole. Of course we were just getting started but the wind was whipping thru the Keyhole. I don’t know how to measure wind speed, but it felt like 50 mph, of course it probably wasn’t that bad. We put on warmer gear, hats, gloves and just waited as we saw one climber after another turn around and not go thru. Finally we waited enough and had to decide if we were going to call it quits or keep moving. I was again ready to turn around, although I didn’t say anything. George was strong and determined so he kept me going. Also as a savior to my piece of mind, a climber appeared in the Keyhole and said he had already summit-ed and was on his way down. He must have got a really early start! He said the Keyhole & the summit were windy, but the rest of the way wasn’t too bad. That was the encouragement I needed so we pressed on and went thru. 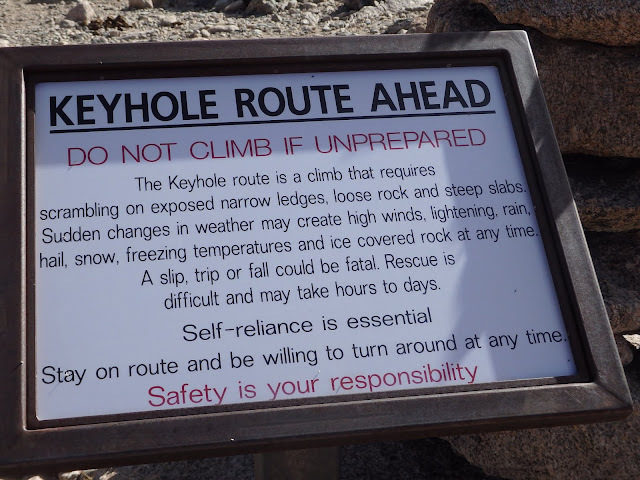 As soon as we entered the Keyhole I thought the wind was strong enough to blow us right off the mountain, but a few more steps away from the Keyhole and the wind seemed more calm. Once thru the Keyhole there are several more sections First are the “Ledges”, followed by “the Trough” which has a big “step” into a section called the “Narrows”. Once past the Narrows, the final section is called the “Home Stretch”. I’d looked at many pictures of each of these sections and knew that each one would present it’s own challenge. For some reason I thought the “narrows” came first after the Keyhole, however, it would come after the Trough and was the section I feared the most, especially if the wind continued to howl. We started across the “Ledges” and they were pretty straight forward. Red circular targets with a yellow center market the rest of the route pretty clearly. The ledges had pretty steep cliffs so we just slowly made out way from bullet to bullet until we would reach the Trough. There were a couple of long stretches which being tall was a great plus. They always say that getting to the top is only half the battle, getting back down back safe is when you’ve really finished the hike. There were a couple of moves in the Ledges that I was not looking forward to on the way back down! I quickly decided my gloves while keeping my hands warm had absolutely no traction on the rocks so they went back in the bag and I climbed the remainder of the day barehanded. This section was a great area for pictures as the scenery completely changed after crossing the the Keyhole. Next we enter the Trough which is a straight up pitch that goes for 1,000 feet. From the bottom of the Trough you can not see the top and it seems like it goes on forever. While there were only a few groups camping on the mountain in front of us, there were quite a few other day hikers both heading the same direction as us as well as those that had been to the summit and were on there way back down. We finally reach the top of the Trough and there is a girl coming down and knows the way she made the final step into the Ledges, but is afraid of coming down by herself so a few hikers help her down the steep section. I probably read about the final step but didn’t know how we were going to get over it. Again it seems easier to go up than it was going to be to get back down. Finally above the final step there is the entrance to the Narrows. This was the part I had been fearing. I had expected a long 150 ft section where only one climber could pass and figured we would have to wait for anyone coming down before we could start. On the way up the Trough one hiker said the Narrows were overhyped and it wasn’t as scary as you think. Again that was good encouragement for me because again leaving the Trough the wind picked up thru the entrance to the Narrows. Again a whole new set of scenery presented itself from the Narrows and I paused for a few pictures. Before I knew it I was across the legendary Narrows and agree as we had perfect conditions it was not as scary as I had thought. Of course this is no place I would ever want to be if it was raining or worse yet storming. Finally on the other side of the Narrows I looked up and got my first glimpse of the Home Stretch. Lord, another 500 feet of climbing straight up. Unlike the Trough which had a lot of loose rock, this was as steep (if not steeper) but this time the rock was all solid. I continued to spot out bullets above and head to each new one as it took me closer to the summit. This section there were both a lot of climbers coming up as well as descending. I thought to myself that going up of course is tiring, but thought coming back down wasn’t going to be any easier. At last we make it to the top of the Home Stretch and for the first time could stand on my feet again and walked across the top of the mountain to the summit. I seeked out the summit medallion and took several pictures. I think it was already noon so already later than I wanted to be on the summit so we didn’t waste anytime making our way back down. 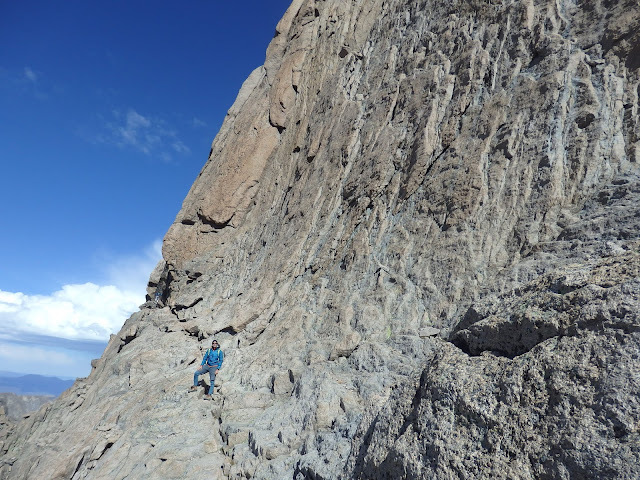 One last deep breath and then to begin the trek back down this slab of rock. Honestly seeing the pure number of climbers going both up and down helped with the route and the confidence that I could do this. We descended the Home Stretch very carefully as well as across the Narrows very carefully and found ourselves on top of the big move we had to climb to get out of the Trough. I wasn’t sure how we were going to do this but as luck would have it once again one of the climbers was proficient and carried a rope and gear that he could wedge in the rocks to create a ladder. He let George and I go first and we were safely thru yet another big challenge. We couldn’t see the top of the Trough on the way down nor could we see the bottom on the decent. 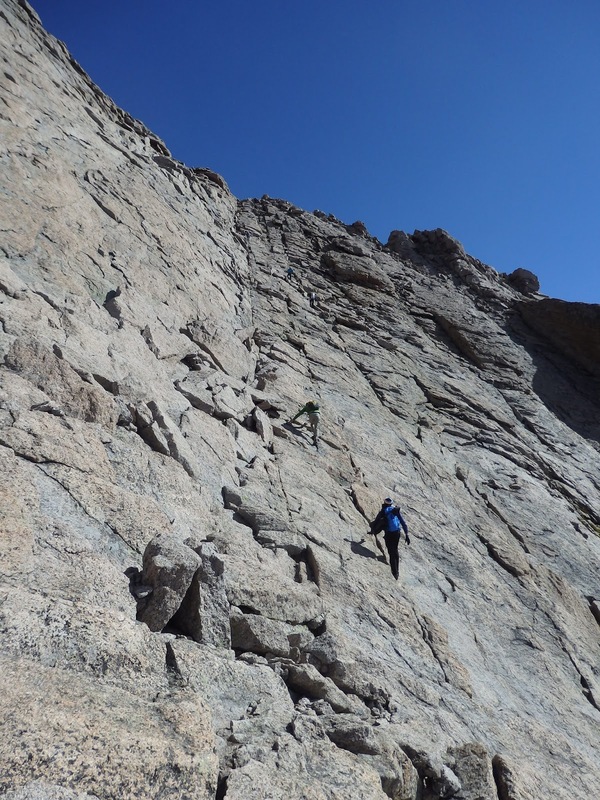 We saw there were still climbers coming upward so it mad it easier to find the next bullet to aim for as we made our way further down. While the decent wasn’t nearly as exhausting, it was extremely steep so much care was taken with each foot and hand placement. We ran into a girl heading up the Trough by herself that was only 1/3 of the way up and she was doubting herself as she had already missed her deadline when she should have turned around, but was “so close” she didn’t want to turn around. We shared with her the facts we knew to possibly discourage her from taking too many risks but she continued upward. We also passed a father and son team on their way up. It was taking nearly as long to descent as it did to climb up when we were sucking air, but made it back to the Ledges. 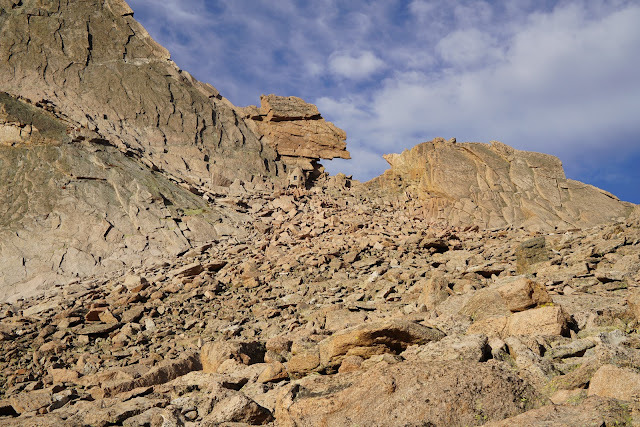 The ledges which I thought would be a tricky part on the way back down ended up not being as scary as I had expected and soon we found ourselves next to the entrance to the windy Keyhole and entrance back to the Boulder Field. The first ½ mile leaving the Keyhole the Boulder Field is extremely steep so again we didn’t make up any time. Ends up it took nearly six ours from base camp to get to the top and back to our tents. I was exhausted from the effort expelled all morning so took off my boots and crawled back into my tent for a 30 minute nap. At this point you would think we are safely off the mountain, yet at over 12,650 feet we still had a long way to go to get back to the trailhead.